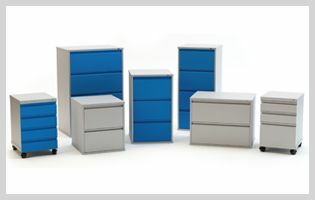 With expert and experienced team of qualified professionals, we offer exclusive range of filling cabinet. We possess advance technological facilities and enough stock of raw material to provide standard and customized filling cabinet. These office filling cabinets are made from high grade steel. It contains central locking system with 2 keys. These filling cabinets contain side drawers for simple and easy usage and 90% extension the whole drawer. The vertical filling cabinet and lateral filing cabinets are available with two, three and four drawer for legal and letter size filling. For the large quantity of documents and files, the lateral filling cabinet is highly suitable due to wide filling space. So it is preferable for the large organizations where big quantity of record are generate. We also provide customized solutions for the filling cabinet according to the office space and requirements. We have designed pedestal cabinets with drawers to place under the table. It contains wheels for the mobility and used to keep files and general stationeries. The pedestal cabinet can be taken from one desk to another. For the smooth function, sliders are provided with 90% extension.